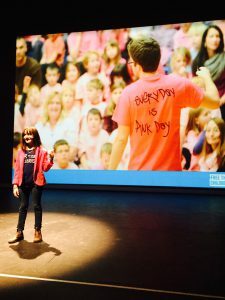 In honour of the 10th anniversary of Pink Shirt Day, I’m sharing an excerpt from my book, Momentus: Small Acts, Big Change, featuring my interview with Travis Price, Anti-Bullying Advocate and Co-Founder of Pink Shirt Day. 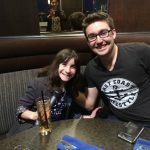 From supporting one bullied teenager in Nova Scotia, to supporting and educating youth around the world, Travis Price is what you might call an “everyday hero”. On the first day of school in 2007, Travis and his friend DJ were in grade 12 and witnessed a grade 9 student being tormented and bullied. They hated that this was happening and they decided to do something. Enough was enough. It was clear the student had become a target based on what he was wearing—a pink T-shirt. After school, Travis and DJ bought 50 pink shirts and then emailed everyone they knew. They wrote, “Tomorrow we are creating a Sea of Pink. Wear pink to stand with this boy. Wear pink to stand up to the boys who bullied him. When we stand together wearing pink, the bullies will be forced to step down.” The next morning, hundred of students showed up in pink shirts. When that grade 9 student walked in and saw his peers in pink, he smiled and sighed. He was not alone. That day, the movement now called Pink Shirt Day, was born. Travis is pretty special to me. We became friends when we both spoke on the 2014/2015 WE Day Tour. His story shows that sometimes the biggest change comes from small acts. Everyone can do something, for someone, at some time. Travis and I caught up via Skype in the middle of his Pink Shirt Day Tour. I asked him if he ever thought his actions 10 years ago would make such a huge difference for so many. But that’s not what happened. 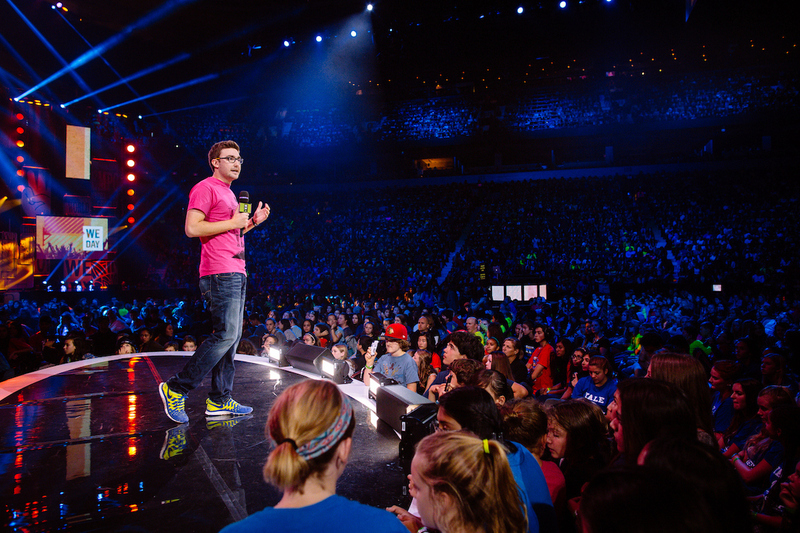 Ten years later, the pink shirt is a symbol against bullying all over the world. Pink Shirt Day is a day where we come together, creating a sea of pink. It’s a day that empowers us to stand up against bullying because we do it together. Today Travis is an anti-bullying advocate, it’s his full-time job. I wanted to know if how he talks about bullying has changed since 2007. The same goes for the person being bullied. When someone is bullied, we shouldn’t label them as a victim and they don’t need to define themselves that way. We need to isolate the experience. This is really the idea behind Pink Shirt Day—keeping the conversation about bullying active and letting everyone know they have allies and people to turn to. It’s as simple as going up to someone and saying, “I’m here for you and am ready to listen to you.” Having an open ear reminds people they are not alone and they have people who support them. I post about Pink Shirt Day on my social media accounts. Sometimes the day gets criticized or receives comments such as, “Why is Pink Shirt Day one day? Why can’t we talk about bullying every day?” I asked Travis what he says to people when he gets these questions. Travis believes that once every student, teacher, and community leader steps up and says “enough is enough” that’s when we’ll make every day Pink Shirt Day. Everyone needs to help make it stop. It can be hard, though, to stand up for what you believe in, or stand up for others you see being bullied. Travis gave me some good advice on what we can do if we find ourselves in that situation. I asked everyone that I interviewed to share their mantra – their words to live by. These words, from author Edward Everett Hale, inspire Travis everyday. Each interview in Momentus is followed by a personal reflection on something that came out of the conversation. I’ll share my reflection on this interview with Travis in the coming days. This excerpt appears here with permission from my Publisher, Nelson Education. To read more from Momentus and the interviews with 18 more of the change-makers that have inspired my journey, you can purchase it at Indigo in-store and online. You can find Travis on Twitter @thepinkdeal and also on Instagram @thepinkdeal. For more information and resources, please visit the Pink Shirt Day website, www.pinkshirtday.ca.